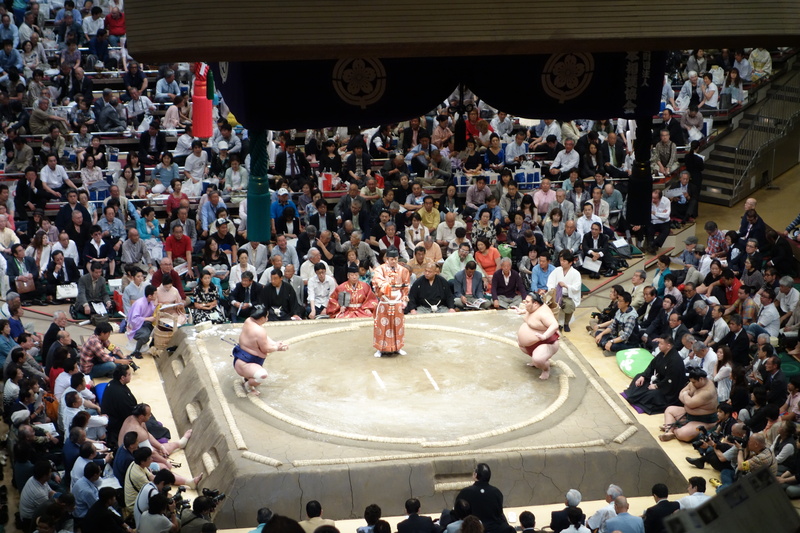 We were lucky enough that our time in Tokyo coincided with one of the annual six honbasho (‘Grand Sumo Champsionships’), only 3 of which take place in Kokugikan (‘the Sumo Hall’) in Tokyo’s Ryōgoku district (over 15 days in January, May and September). Gabby’s dad was always a fan and on his recommendation we had to go and see this 2000 year old sport. 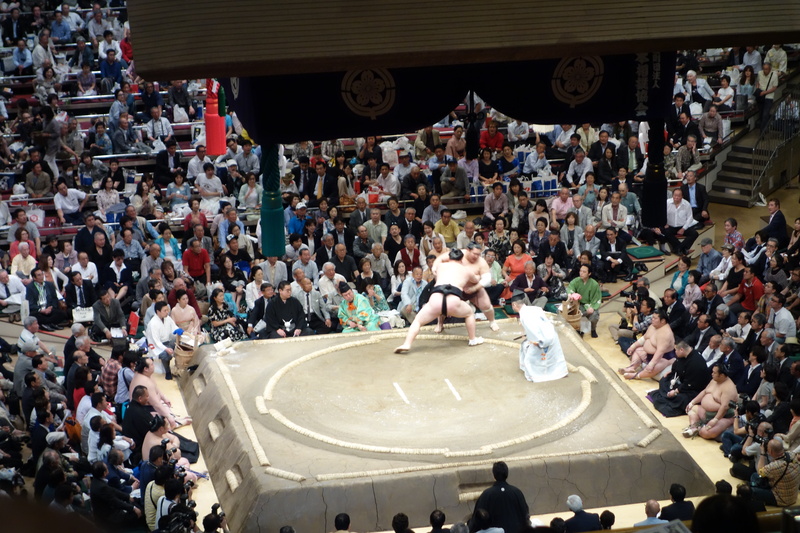 Knowing that tickets can sell out quick, especially for weekend and final fights (which end up being allocated by lottery selection), we went to the Kokugikan ticket office the week before the tournament to get seats in the main stand, the most desirable stand, so that we would an unobstructed view of both wrestlers. We paid 7500¥ for our tickets on the upper main stand in the front rows. This is slightly expensive but considering fighting starts at 9:00 am and finishes at 6:00 pm, I think this is pretty good value for a full day’s entertainment! You can also book a ‘box’. 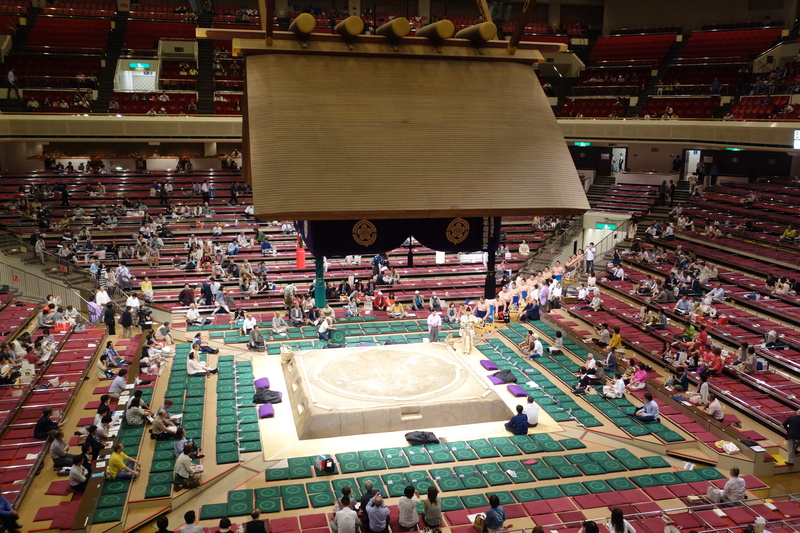 Though closer to the action, you would be a crazy westerner indeed to think you could manage to fit four people inside the 1.5 m2 tatami mats and sit cross legged for 9 hours without a lifetime’s practice. The upstairs seats are very comfortable! Although we wanted to go for the whole day, we were forbidden by our language teachers from skipping morning class. When we asked, they simply informed us that we would be allowed to go to watch the fights from 2 o’clock onwards. 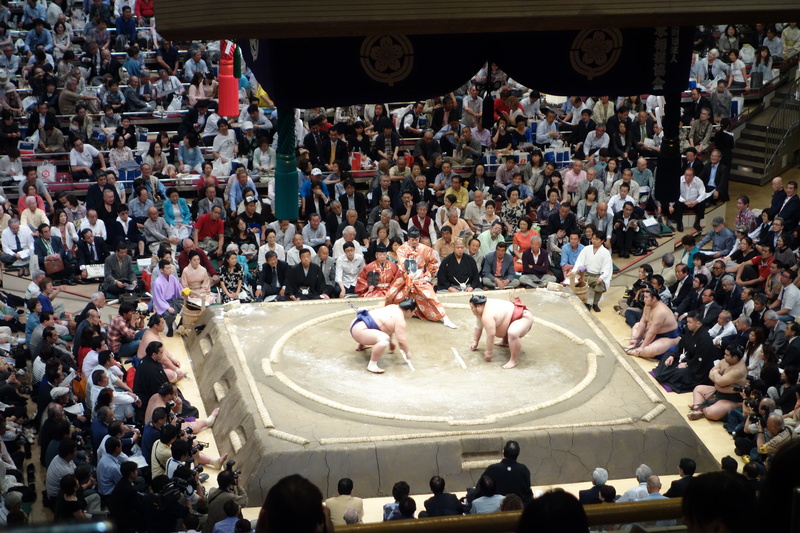 While it was in no doubt that one of their concerns was for us to be good pupils (having that day learnt ‘yasumimasu’ – to be absent, we had even asked in Japanese), I think that their main issue was that we would be bored of the sumo, or get a bad impression of sumo, from having to sit through the morning’s junior fights. Whilst the Japanese are very kind, this was the first time we had had to negotiate anything with them, and it was clear that ever so politely, there was no way we would get what we wanted. Every time we would reformulate the question, or make a counter argument (“we’ve already paid”, “as it’s our first time all fights will be interesting”, “wouldn’t the junior jonokuchi wrestlers appreciate a bit of support?”) these were met with a grimace, no counter argument and just a reiteration that we would be at school in the morning. We went to school in the morning. 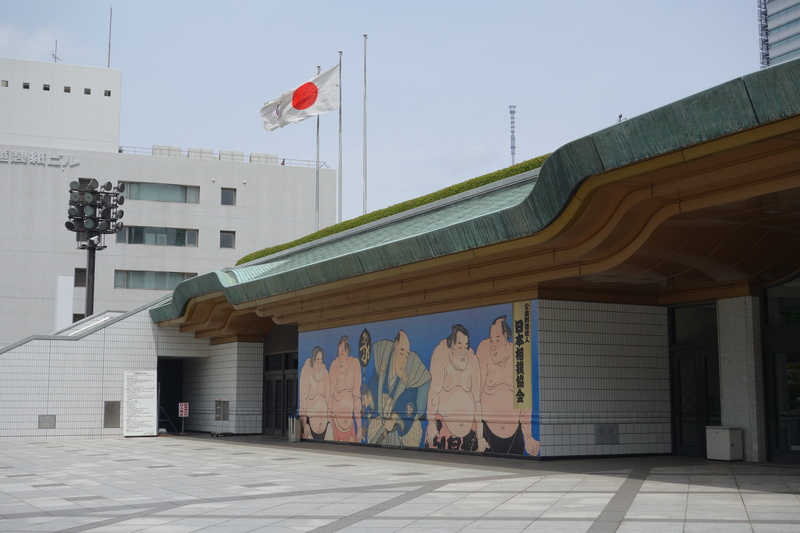 When we arrived, we took a couple of photos with the rikishi, the proper term for a sumo wrestler – not “sumo” (this is the name of the sport), and the impressive trophy cabinet (including sweets and sake). In all the excitement I dropped my ticket. However, this turned out not to be a problem since once you are inside the only check of your ticket is your honesty – and therefore, the only thing between a Japanese person and the empty front row seat is their morality. In any case, two and half hours into the tournament, a uniformed man appeared by my seat with my ticket which had been found, handed-in and which was being personally delivered back to me! The tickets had warned us not to bring drinks with us to the arena. So we left our flask at home and were forced to buy expensive tiny bottled water at the stadium along with my quite expensive bento box. When we got to our seats, as our teachers had warned us, the hall was pretty empty, most people didn’t show up until 4 o’clock for the best ranked fighters. However, always a paradox, the Japanese that were sitting next to us had brought an extensive picnic, complete with lots of beer and sake. 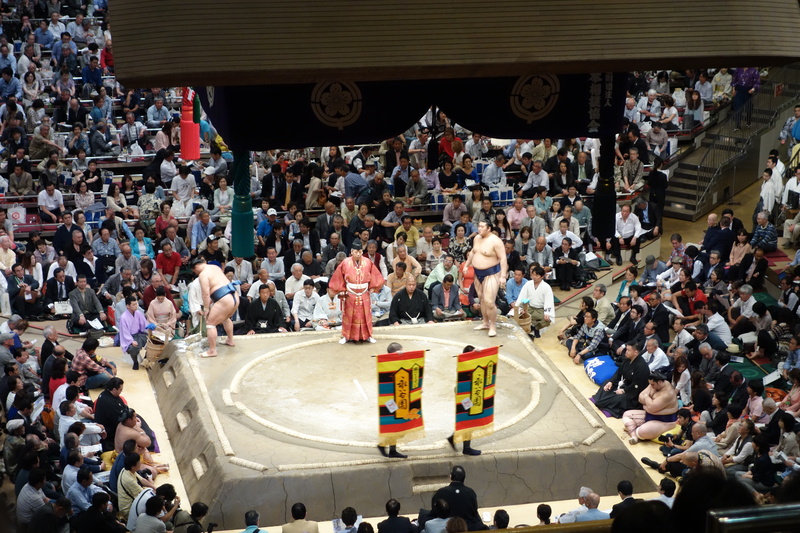 The chairs even had little fold-out tables, which made it clear that eating and drinking through the non-stop (literally no break) day-long sumo wrestling was almost as much part of the fun as the fights themselves. 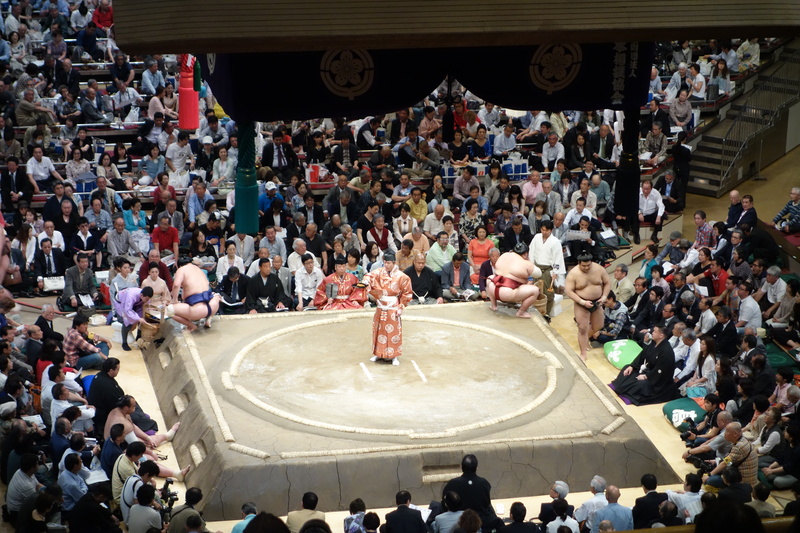 Rules: both fighters have to touch their knuckles against the ground at the same time to begin a fight, no closed fist, don’t lose your loincloth, don’t pull hair, anything else goes and first wrestler to touch any part of his body (except the soles of their feet) against the ground or touch the outside of the ring loses. As you can see, the rules are simple enough, like the best things are, and let the impressive physical specimen, that are these human mountains, express themselves fully in the ring. However, in the case of a ‘line-call’, they both fall within fractions of a second of each, four seated judges get together at the centre for a powwow. The result of their confabulation is final. Traditions: there are a number of traditions which punctuate the day’s fighting. 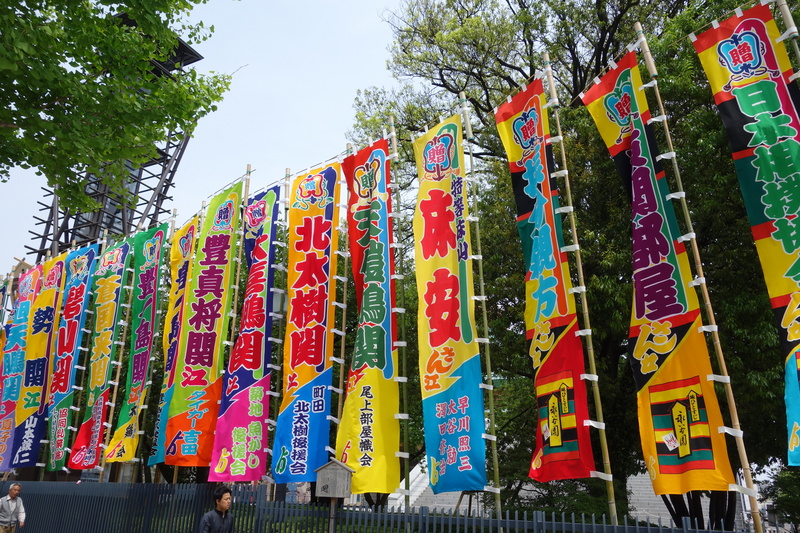 There are ceremonies which are carried out throughout the day. 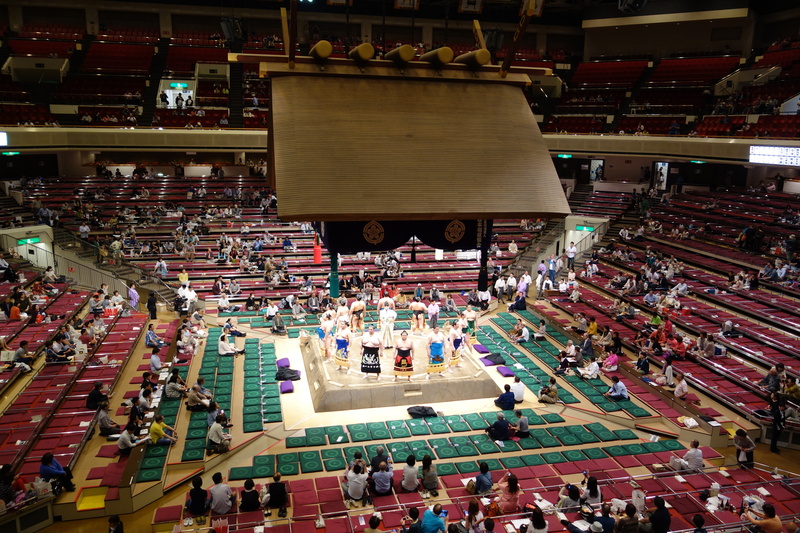 We saw the processional presentation of the rikishi as they come out in their respective skill class for the dohyō-iri (“ring entering ceremony”). 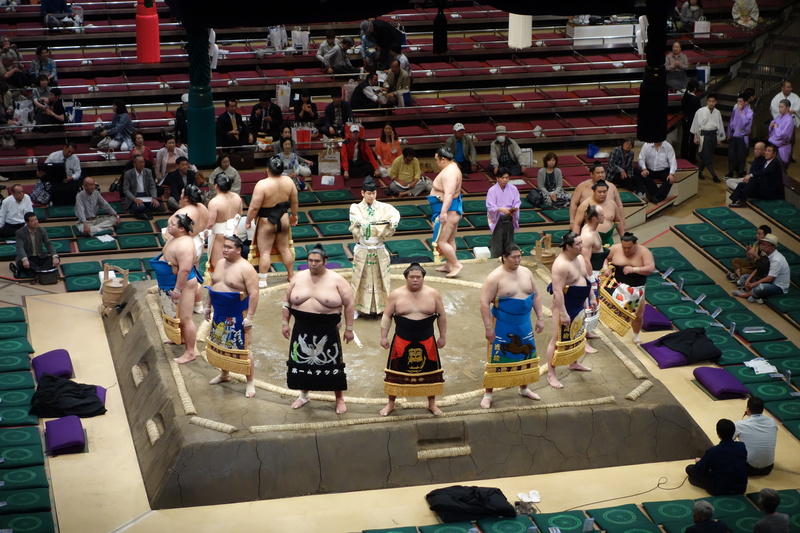 In the photos, you can see that they are all wearing personalised decorative loincloth covers as their shikona (“wrestling name”) and home town are read out. We were delighted to be able to understand this and were able to tell that there were wrestlers from Russia, Mongolia, Brazil, Egypt, Czech Republic and Estonia competing. 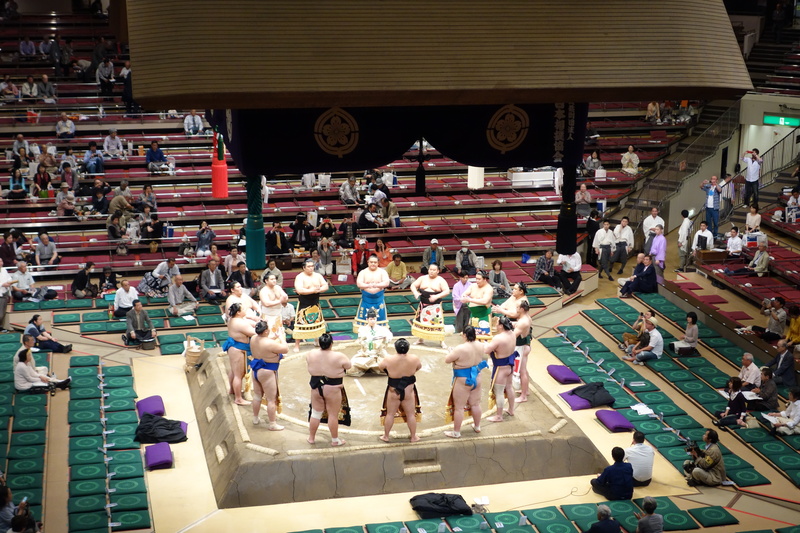 We also saw a skill presentation by a former sumo champion and the closing bow-twirling exhibition. Routine: Before a fight commences there are a number of routines which the fighters go through. First, a merry band ring cleaners appear (with watering can) to tidy up from the last few fights. Then, the wrestler’s pillow is carried out for them, three fights before theirs, so they can sit comfortably and wait for their fight. 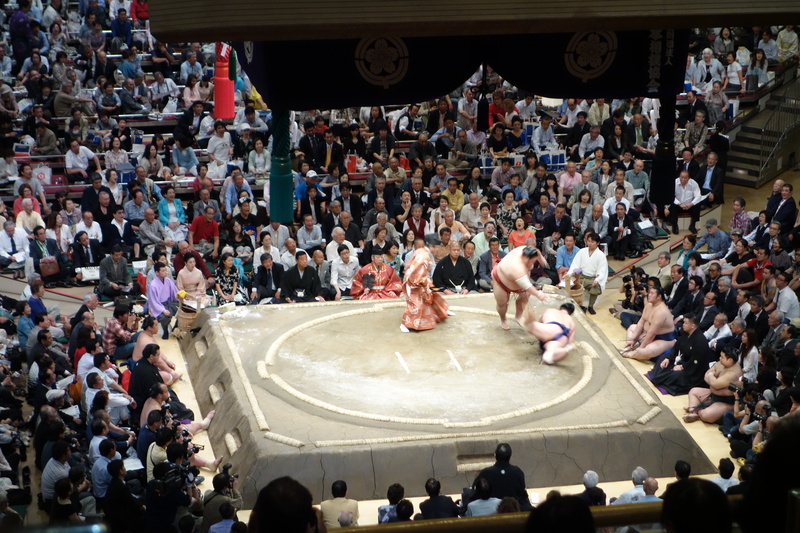 When it’s their turn, their name is sung by a ‘minstrel’ as they ascend onto the dohyō (‘ring’), which is half a metre high and made out of compacted rice straw and covered in clay and sand. 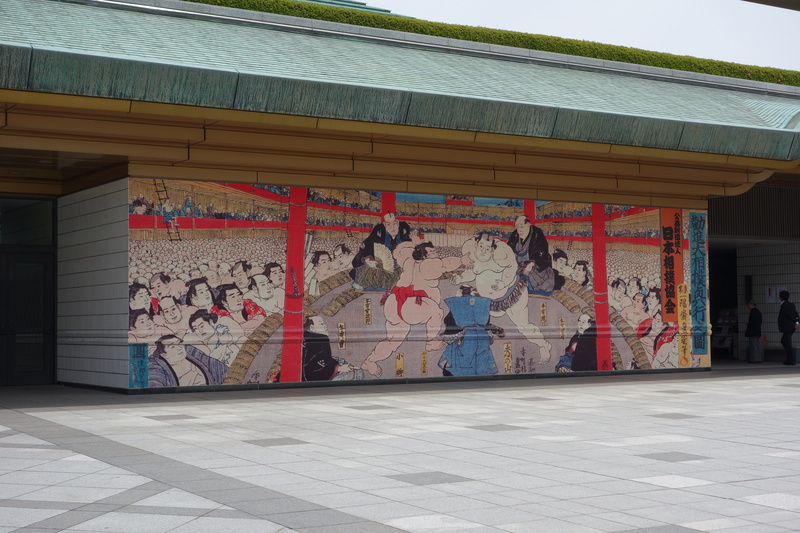 Above it, is hung a roof resembling a Shinto shrine because the dohyō is sacred, due to the origins of Sumo as a religious strength ritual in Shinto; women are forbidden from touching it. But it’s ok for the more popular fighters to have the sponsor-banners of fast food restaurants (wouldn’t think they’d want to be associated with this sport) trouped around the ring before a bout! (I hear that rikishi get snapped up as the face of dieting companies’ ads after they retire). 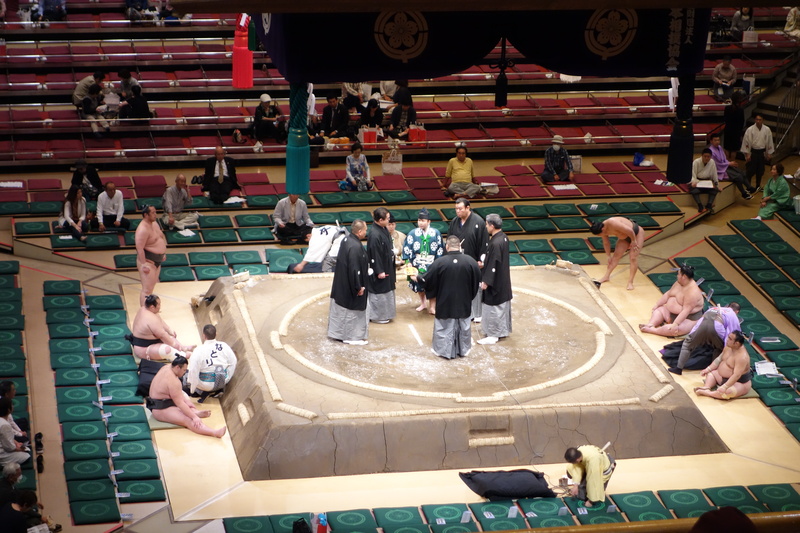 Then the wrestlers engage in about 5 minutes of sizing each other up, consisting of leg lifting (showing flexibility), crouching (showing suppleness), clapping (showing balance) and a good lot of belly and loincloth slapping (just for fun). In between this there is a good amount of salt that gets thrown onto the ring (not, as a fellow Australian tourist remarked, talc or chalk this is salt because it purifies the dohyō and keeps away evil spirits), like most athletes, they can quite superstitious and the amount of salt can be quite large, I hope it’s not Maldon! The colourful ref, with his war fan indicates the various starting positions, before a final round of water drinking and towelling off. 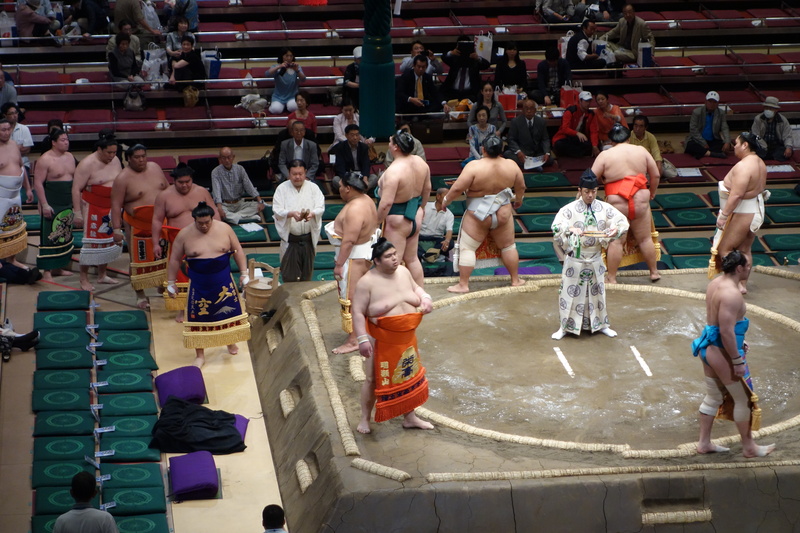 Tactics: there are no weight classes in Sumo. All wrestlers, once they reach a certain skill level compete against each other. This means that large wrestler will fight small wrestlers etc…. The reason this is not uneven as it seems is because of the variety of tactics used during a fight. Some opt to let their weight do the talking and push their opponent out of the ring. Others, use throes, quick palm slaps to the face, carries, arm locks, loincloth pulls and sidesteps… and the best use all of these. 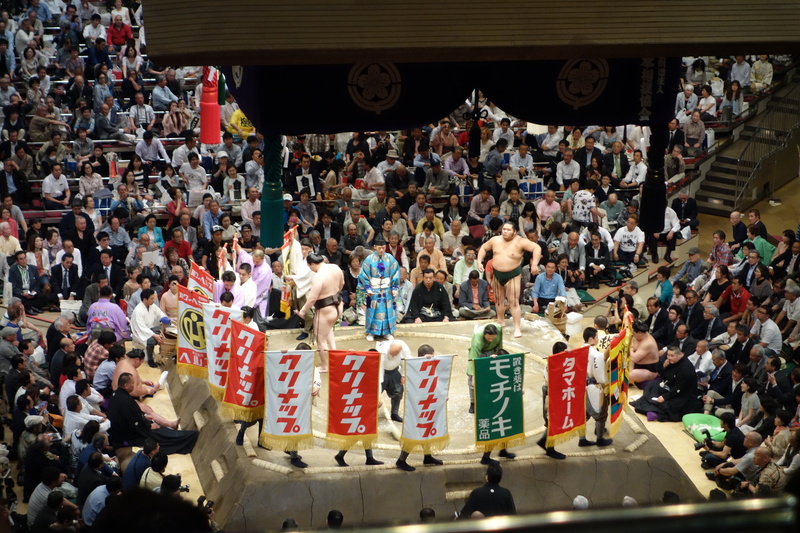 What was really impressive is just how athletic the rikishi are. They are fast, nimble, agile (not synonyms when as all three words are necessary when describing these guys), strong, supple, controlled and explosive (again not antonyms in this case). The one thing they are definitely missing though is endurance. 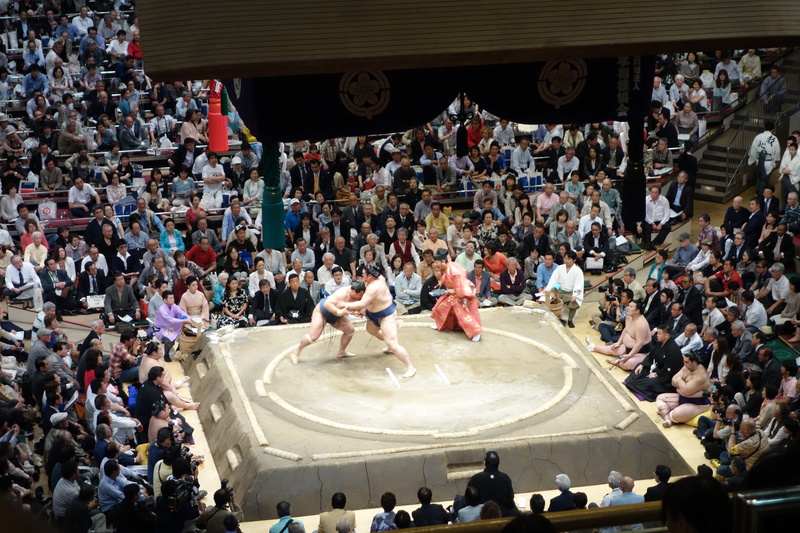 We got to watch about 50 fights in all, and were delighted by the sight of human mountains falling onto the crowd, spectators throwing their cushions into the air in appreciation of a particularly worthy contest and the moments of calm as fat, naked, big babies engage in a spot of attritional hugging in front of 20,000 people. 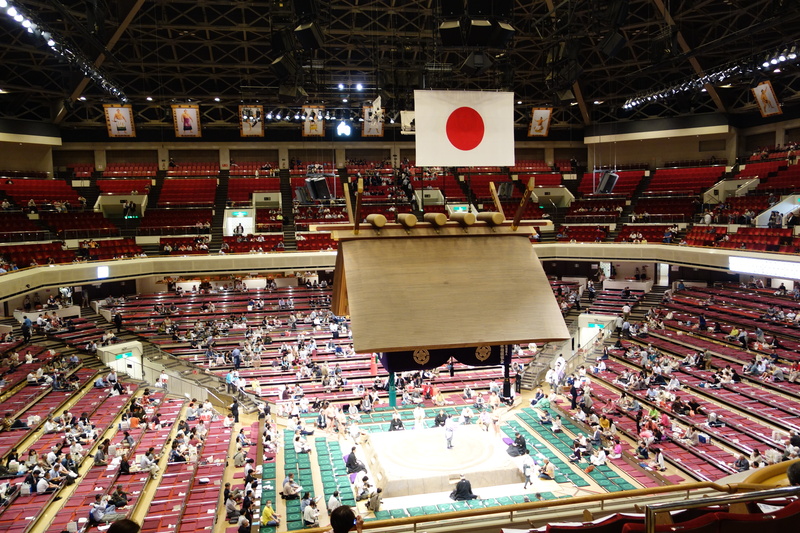 I loved our day at the Kokugikan, what a great recommendation! As always it’s amazing how in Japan things that seem to be long past their time, anachronistically thriving and as fundamental to people’s cultural foreground as ever. All this means you can of course get some plasticated bling from the souvenir stand. We did’t go for any of the crazy souvenirs but we did make sure we watched the finals on TV the following week (and Prime Minister Abe getting almost very unceremoniously crushed by the trophy as he lifter it while presenting to the winner (who made it look like a light toy)). Tokyo Museum of Emerging Science and Innovation & Kobe beef in Ginza! 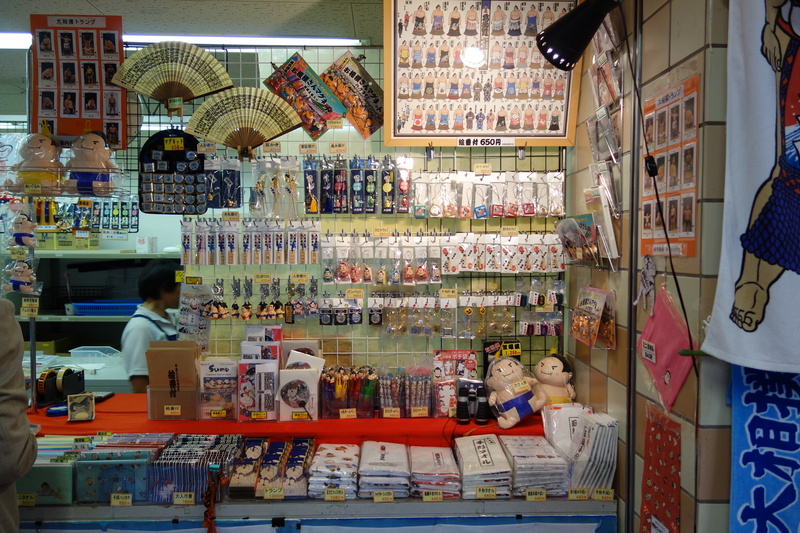 J World in Sunshine City – East Ikebukuro. Anime Heaven for kids and adults! Hanami Season in Tokyo – beautiful Cherry Blossom! 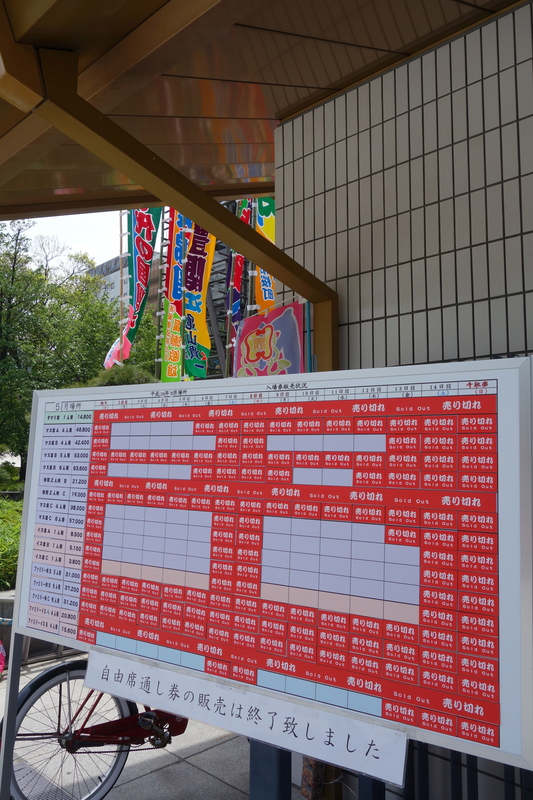 Amazing Soba near Ogawamachi Station – Soba and Tempura!